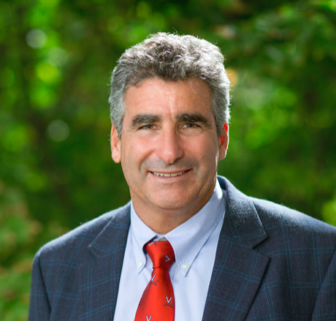 The finalist for the University of Connecticut presidency is Thomas C. Katsouleas, the provost and executive vice president of the University of Virginia, according to sources familiar with the six-month search for the school’s 16th president. The university’s Board of Trustees has a regularly scheduled meeting Wednesday, when the trustees are expected to be updated in executive session about Katsouleas’ private meeting Monday night with Gov. Ned Lamont and business leaders. Lamont declined to comment on the meeting, but he is said to have expressed his support to trustees. A vote naming Katsouleas as president could come next week. Katsouleas, 60, who could not be reached for comment Tuesday night, is an inventor and researcher who taught at the University of Southern California for 14 years and served as dean of the engineering school at Duke University for seven years before arriving as provost — the chief academic officer — at the University of Virginia in 2015. His departure from UVa has been planned since shortly after the president who hired him, Teresa A. Sullivan, announced her intention in 2017 to resign. Under pressure from a leading board member, Sullivan first quit in 2012, only to be reinstated when students, faculty and alumni objected to her ouster. Katsouleas was one of three academics publicly identified last year as finalists for president of the University of Utah, a school with a search process more public than UConn’s. The university’s search committee works in confidence and has not identified either of the two finalists interviewed by Lamont the weekend after taking office on Jan. 9. Lamont initially was noncommittal about the candidates, but invited Katsouleas back for an unusual vetting session with prominent business leaders to talk about the new governor’s desire for UConn to take a stronger role in driving economic growth in Connecticut. At UVa, Katsouleas and a counterpart at Virginia Tech organized a coalition of universities and colleges in an effort to promote economic development throughout Virginia. He also supported the involvement of UVa in a project to restore the Yamuna, a dead waterway in India. Katsouleas has two physics degrees from UCLA, earning a B.S. in 1979 and a Ph.D in 1984. He began a career in teaching and researching physics, electrical engineering and computer science at USC. He grew up in California, where he was an ocean lifeguard in Los Angeles County for decades, beginning as a teenager, and an avid sailor. If hired at UConn, he will succeed Susan Herbst, who is leaving after eight years without developing a broad base of contacts at the General Assembly. In addition to meeting Lamont’s demands for playing a larger role in economic development, Katsouleas would face the challenges of stabilizing the finances of the UConn Health Center and addressing deficits in the athletic department, a result attributed at least in part to the university’s failure to gain entrance to one of the so-called power conferences in collegiate sports.